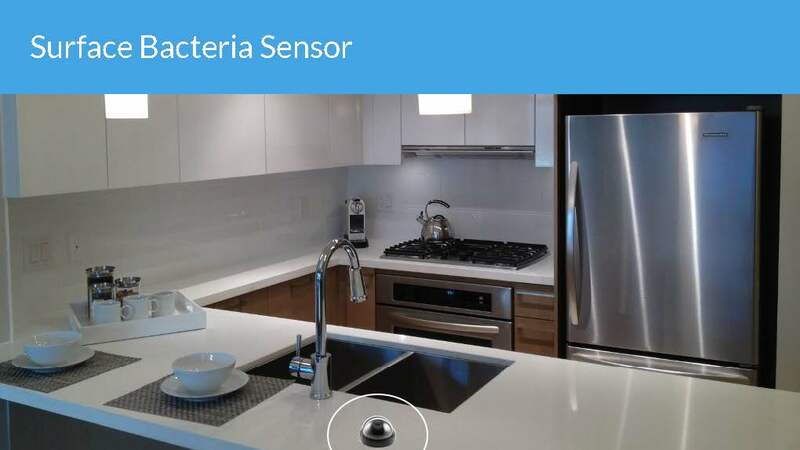 HyCube is a smart home system designed to help people maintain and monitor the cleanliness and health of their home by making coordination and detection of bacteria easier using sensor technology. 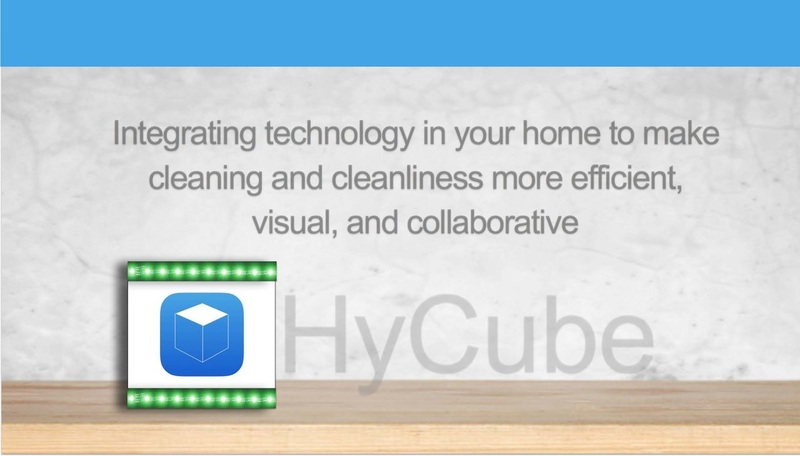 By integrating multiple displays, HyCube makes cleaning more visual, efficient, and collaborative. 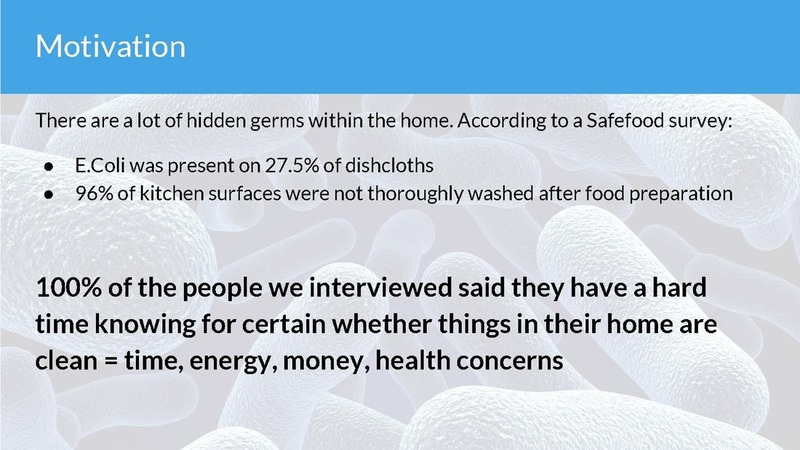 100% of the people we interviewed said they have a hard time knowing for certain whether things in their home are clean. 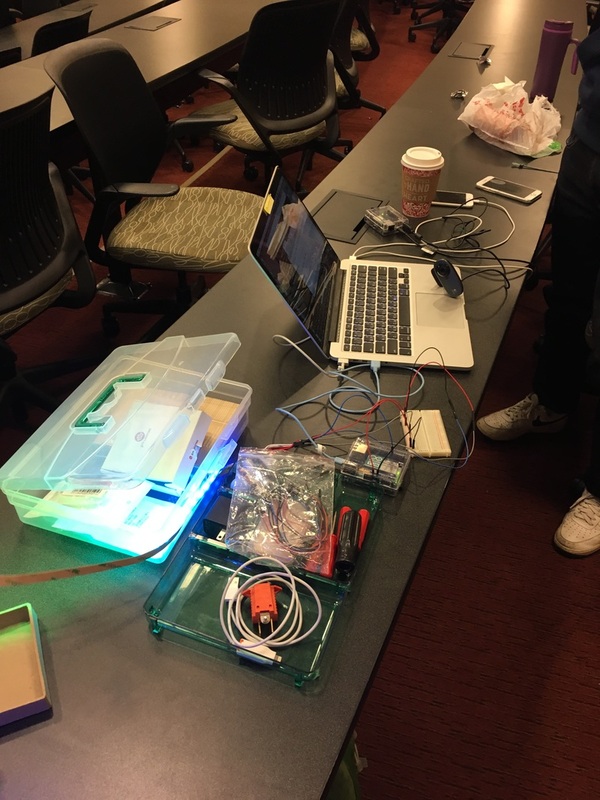 ​Moreover, we learned about the disproportionate allocation of cleaning tasks and decided that a smart home technology could serve to objectively schedule tasks and facilitate communication among busy students and working professionals that live with multiple people. We asked six people to keep a written diary and a photo diary, followed by exit interviews. We asked our participants to take 5 photos of things they believed were dirty in their home, and 5 things that they believed were clean in their apartment, as well as a short explanation about how they determined the cleanliness of those objects or spaces. We selected this method to better understand how people define cleanliness (as opposed to tidiness), and to get a better grasp on how people can tell whether something warrants cleaning. ​Roommates want to ensure that the allocation of tasks is even in the long term. There are certain tasks that are considered more arduous (such as taking out the trash or cleaning a very long hallway), and everyone is expected to take turns trying it periodically. Some stimuli include visual cues, touch, and smell. 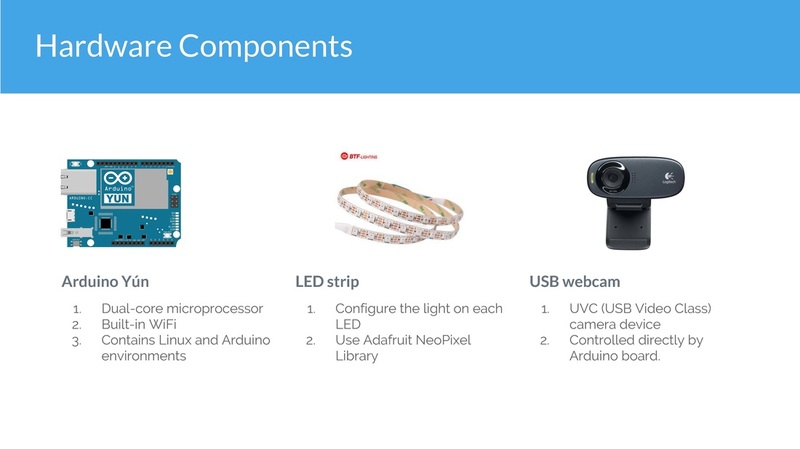 Our design solution should incorporate these senses into a single product design that keeps users up-to-date on what they need to do. Cleaning is a collective, simultaneous activity among roommates. Roommates motivate one another and keep each other accountable for cleaning tasks. In smaller group settings, it’s often easier to get more people involved, but the more people there are, the less likely that everyone will be involved. Usually, there will be a small subset of people who care more about cleaning that will end up taking on more of the cleaning tasks. Roommates almost rely on one another to get reminded of when the next round of cleaning needs to be done and when the trash and recyclables need to be taken out. ​However, cleaning is also a time consuming activity. It can be difficult for young students and working professionals to find the time to clean. For designing our user enactments, we started by generating a wide variety of ideas about different scenarios around people’s decisions to start cleaning. 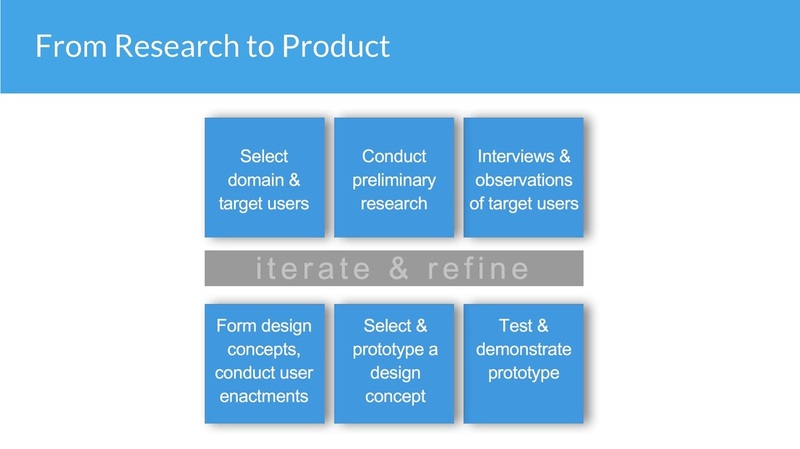 Our goal was to generate as many different ideas, group them into common themes, and have people in our target interact with these lower fidelity prototypes in a contextualized setting. After we conducted these user enactments, we clustered our observations and notes into themes based on the following standards. We conducted the user enactments in a shared kitchen space at the Foundry. We recruited five participants in our target audience - college students or young working professionals who live with roommates - for six user enactments. We had more male participants to address our earlier disproportionate representation of women in our diary studies. We situated each of the lower fidelity paper prototypes in each space. After participants acted out each scenario, we followed up with short interview questions to get their emotional responses and feedback on the user enactments. We had at least one person taking notes at all times and took photos. We referred to these thorough notes and photos for our affinity analysis. We had a disproportionate representation of University of Michigan Master’s students. Users appreciated the visual, interactive, and artistic elements of the cube. They expressed that they would like to see colors to represent the type of space it is and its level of cleanliness. 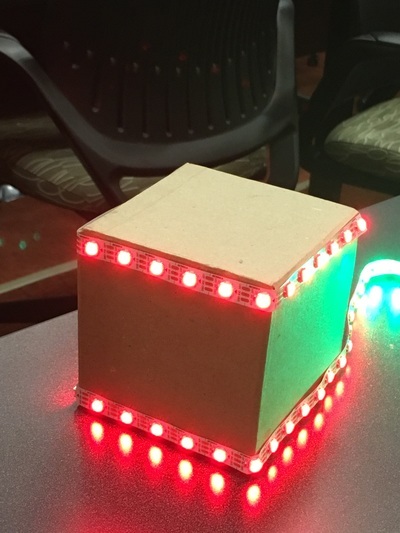 More than half the participants explained that they would expect the cube to include some labels (either by the full name or by initials) to indicate which side belongs to which space. One participant suggested using a generic picture of different rooms to communicate which space each side was representing. The limitation of the cube would be that one would have to turn it to see all of the side. The smart kitchen counters user enactment showed that people appreciate contextual feedback (on the counter itself) and would prefer to get push notifications on their mobile device only if they were away from the display. Too many notifications would feel redundant and even unmeaningful. While our users said that receiving notifications would likely change their behavior or encourage them to do so, they mentioned that they would become annoyed with too many notifications and would eventually default to ignoring them or working around them to make them stop. 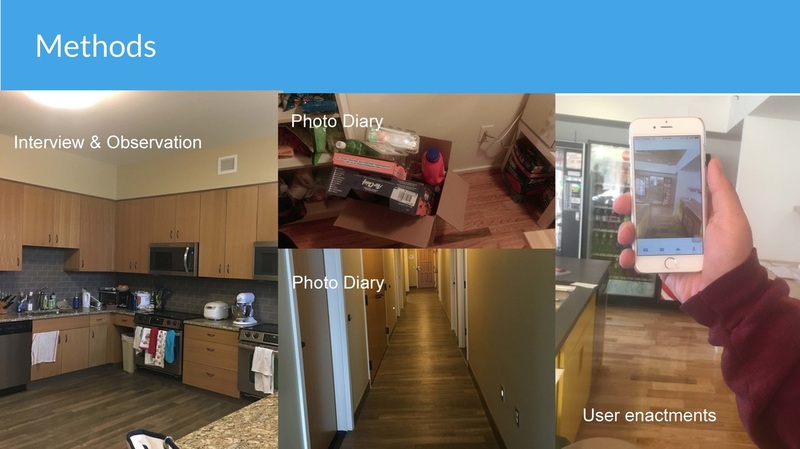 Our participants liked the idea of the display for scheduling tasks and holding users accountable, but explained that it is likely that people's experience with it would differ based on the number and nature of roommates that they have. For example, the app would not afford anonymity where there are only two roommates, and could cause passive-aggressiveness. Conversely, for one more outgoing participant who is not afraid of confrontation, the display idea seemed like an effective way to communicate with roommates beyond personal text message conversations and to keep track of tasks. Those who participated in our enactments indicated that they prefer more visual representations of cleanliness and tasks, as shown by the cube, the smart kitchen counters, and the display idea. 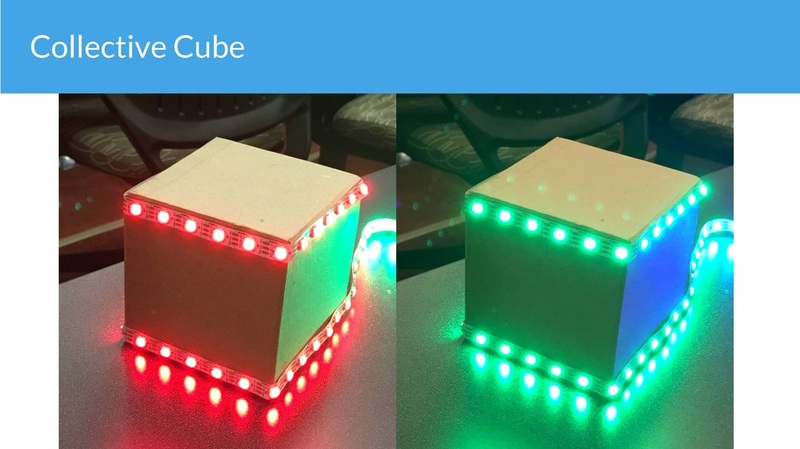 For example, our users indicated that they would like for each side of the cube idea to have a different color which could be associated with a particular room or task as opposed to only using words. A second color would indicate how clean the room or task would be. 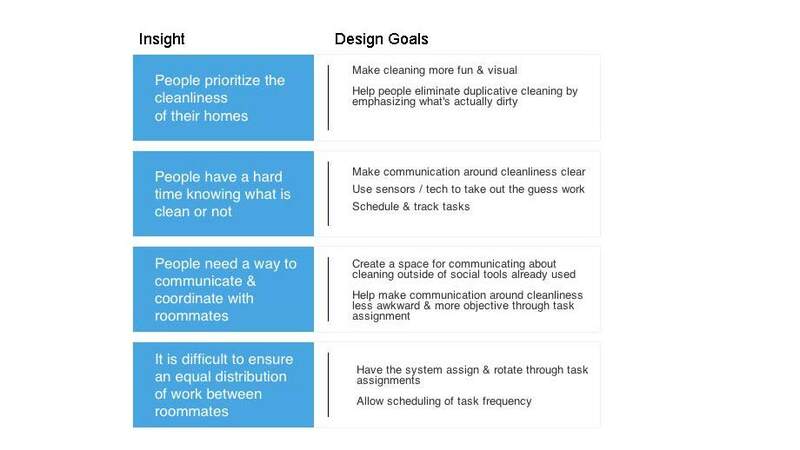 Even going beyond just the visual representation of whether a space needs to be cleaned or not, users found solutions that provided an idea of which tasks need to be complete as very helpful. Our users thought that while our augmented reality idea is cool and futuristic, they did not feel that it is entirely practical or that it would be an option that they would interact with for a sustained amount of time. They explained that while they appreciate the novelty of the idea, it overcomplicates cleaning for them. This feedback is a great example of how sometimes technological interventions can over-operationalize or complicate tasks more than is necessary. However, they did mention it would be helpful to drill down into spaces that are marked as unclean to be able to see a list of tasks. If we are to continue with the Pictures Enactment, it would be best to set the bar a little higher, as participants commented that 50% seemed too low to seem “satisfactory.” They recommended setting 70% matching as the minimum bar. They also mentioned that they did not find the scanning to be as helpful, as they feel that they can rely on their vision to understand whether their room was organized or needed to be cleaned. Our study consisted of observations with five people, diary studies and follow-up interviews with six people, most of whom were graduate students with some working professionals included. People prioritize the cleanliness of their house but often neglect cleaning until becomes noticeably dirty or cluttered. They are using visual cues to mentally create and organize tasks but do not have a systematic way of doing so. People have a hard time knowing what’s clean or not. 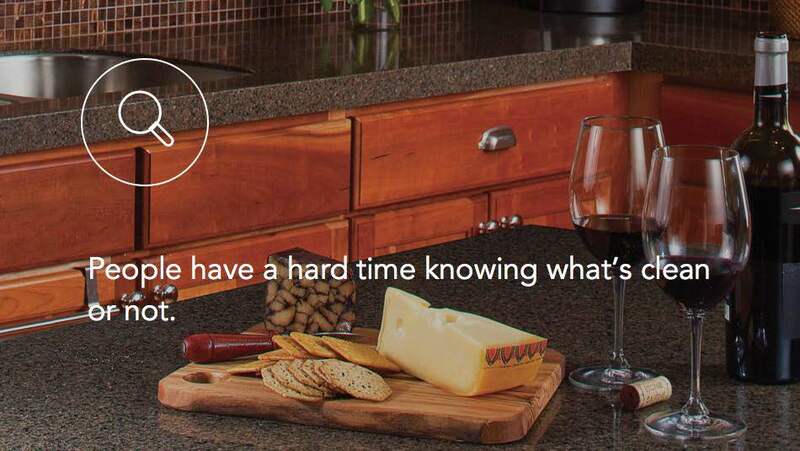 They can tell if there are oil stains, dust, or hair, but they have no way of understanding if harmful bacteria or germs have contaminated any of their surfaces. There is a lot of guesswork involved in cleaning, which also leads to duplicate cleaning on surfaces that may not need as much attention. 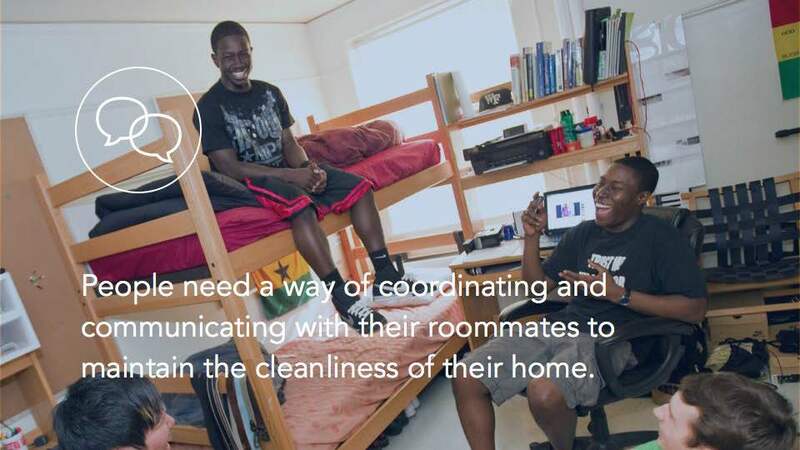 People also need a way of coordinating and communicating with their roommates to maintain the cleanliness of their home. For those who live with many other roommates, they would like to have a separate objective forum to delegate tasks and discuss what needs to be done. Moreover, this applies to roommates who may not be as familiar with each other and need some sort of a transparent and comfortable platform to objectively negotiate the jobs that need to be complete. It is difficult to ensure an equal distribution of work among roommates. Some people end up doing more cleaning than others because they value it more. Others end up piggybacking off of people who tend to be more proactive about cleaning. 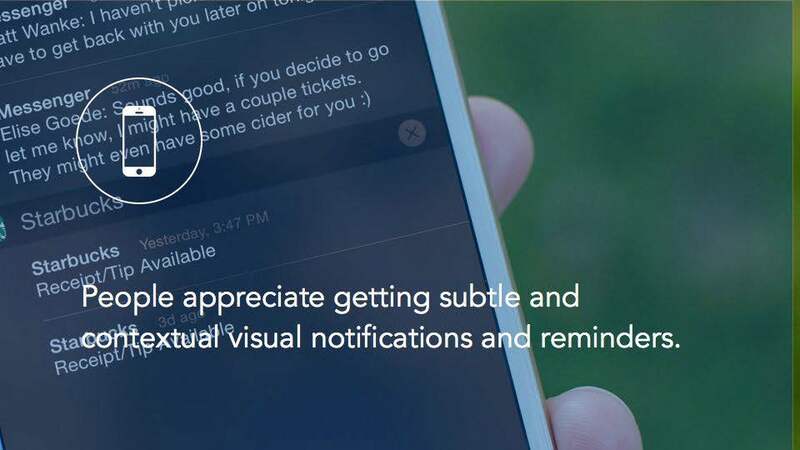 People also appreciate getting subtle and contextual visual notifications and reminders. They were not comfortable with systems automatically scheduling events for cleaning, nor were they completely enamoured with the idea of gamification, as this would depend on the household rules and the relationship among the roommates. 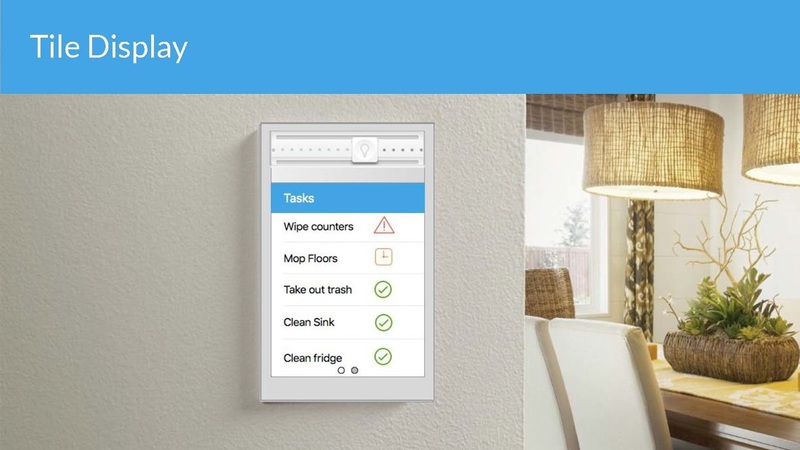 Prioritize cleaning tasks by notifying them when spaces actually get dirty. People were spending way too much time either neglecting cleaning entirely or cleaning the same spaces over and over again because they did not know what was present on each of these surfaces. 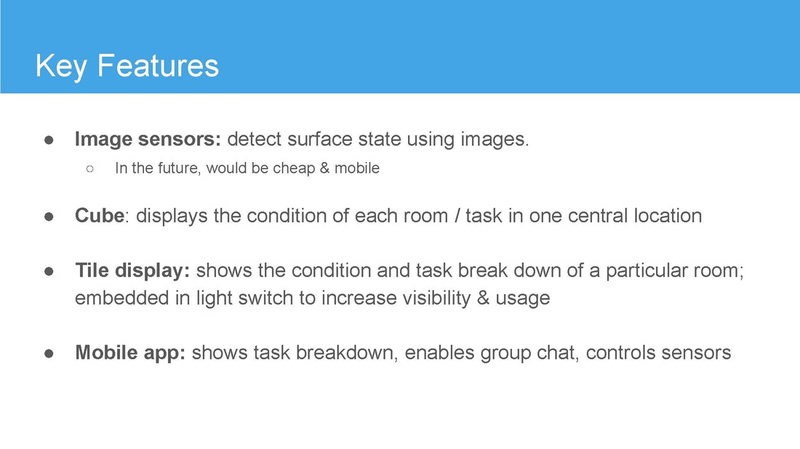 Help people prioritize cleaning tasks by notifying them when spaces actually get dirty. People were spending way too much time either neglecting cleaning entirely or cleaning the same spaces over and over again because they did not know what was present on each of these surfaces. We would have liked to connect the image sensors with the cube to make it reflect the actual level of cleanliness for each space. This would be a great next step to strive for in developing the product. It would be great to have each side of the cube provide a camera view of each space so that users would be able to monitor the condition in real time. Another next step would be figuring out how to surface all of this information, including the sensor visualization on this tile, which will be integrated into existing light switches. 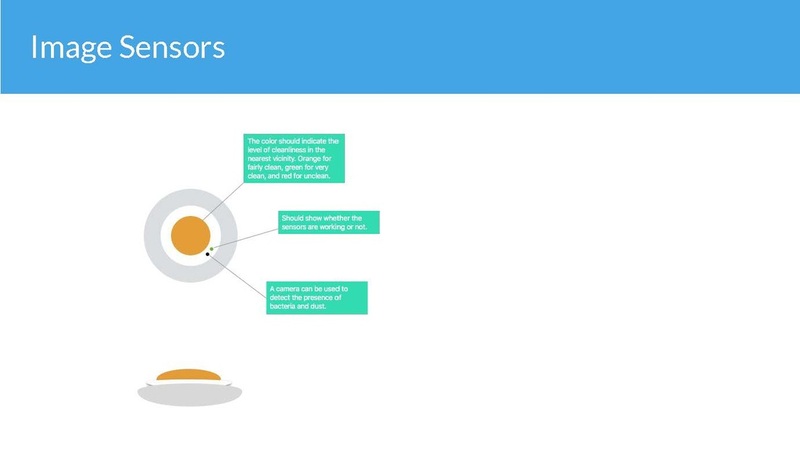 Our product would depend on whether people are able to buy sensors and how mobile these sensors would be. 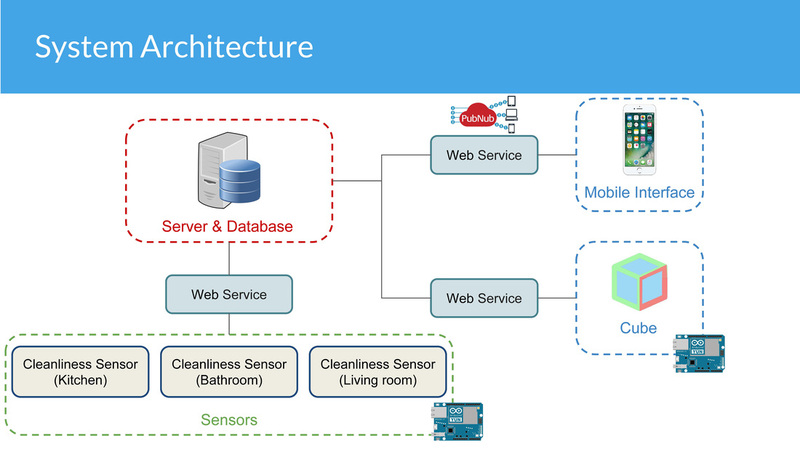 We are assuming that these sensors would be able to fairly detect the overall cleanliness of a space. 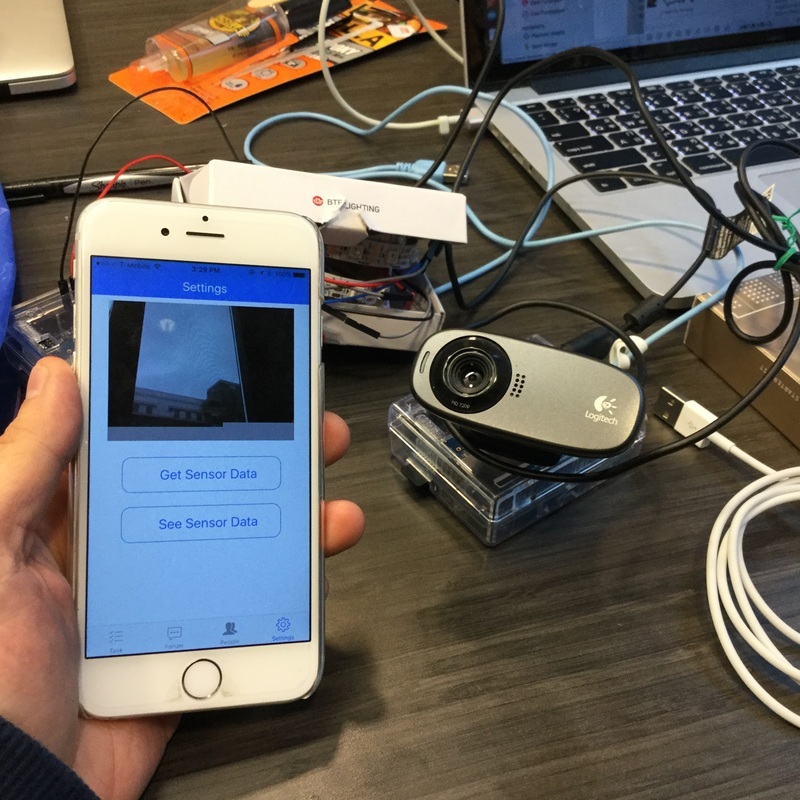 It is also possible that putting certain props or accessories that carry bacteria and germs, such as one's cell phone, could launch false alarms. We also acknowledge that this product may empower those who care a lot about cleanliness and may contribute to some tension and stress among roommates, but we believe our product will at least support constructive, informed conversations about how to better support health and cleanliness in the home. We would also need to think carefully about the technology that could actually detect cleanliness. We believe image sensors would be one way, but we would like to continue doing research on other technologies and tools that could detect bacteria and germs more effectively and efficiently. 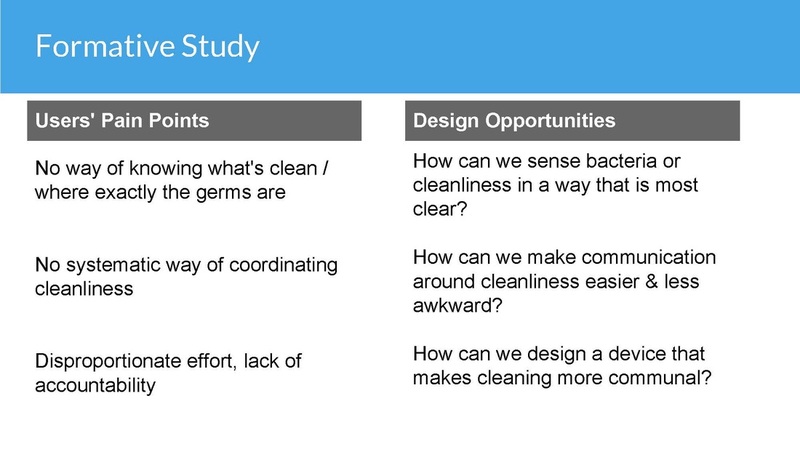 From this entire project, we learned that everyone measures, perceives, and responds to cleanliness differently. Since we focus on those who live with others, we knew that it would be important to understand, and design for, different roommate dynamics (positive, distant, and negative) and people with varying levels of investment and interest in cleaning. We realized the importance of preparing the image sensors to measure the level of cleanliness and alert the user through changing the colors on the cube; this requires little of the user as the system will passively collect information about the space and communicate it with the user. 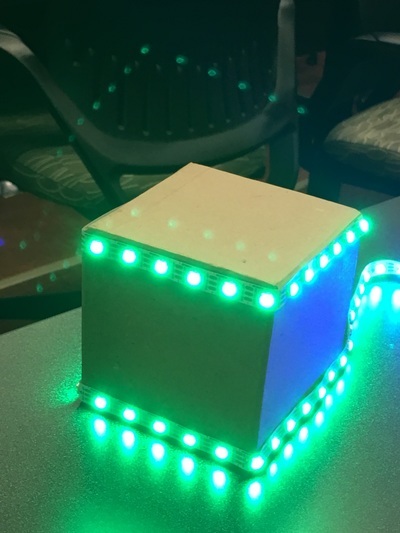 We also noticed the importance of creating a strong narrative arc to explain how the cube, mobile app, and contextualized display would communicate with one another. The cube alone would simply not provide as much contextualized information and would serve as a collective monitoring tool, constantly reminding the roommates that the cleaning covenant they have agreed to respect. 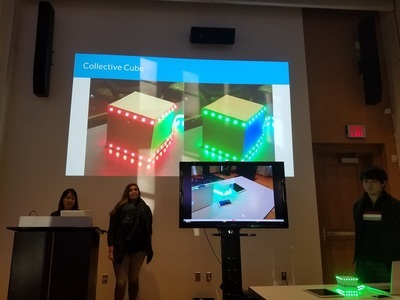 For controlling the settings on the cube, a mobile app was needed; this requires more input from the user, but allows them to be connected with their roommates through a group chat and holds them accountable to assigned cleaning tasks. ​The tile display would be embedded in each surface and provide specific guidance on where and how to clean the spaces. 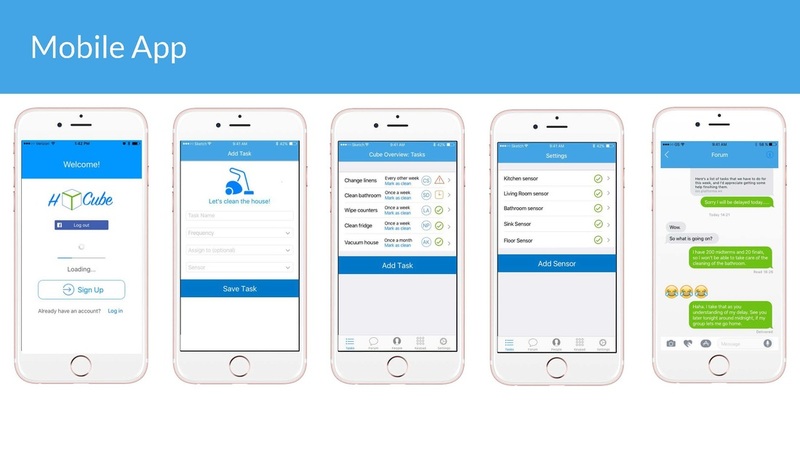 The tile provides richer information than the cube by giving more of task breakdown and instructions on how and where to clean, but still allows users to understand how clean their space is without having to interact with a mobile app. Through our research, we learned that people wouldn't mind learning about the condition of their home through their phone while they are away (e.g. getting a notification from a roommate that they cannot complete their tasks), but would like to minimize how much they have to use their phone while they are at home for this type of information. 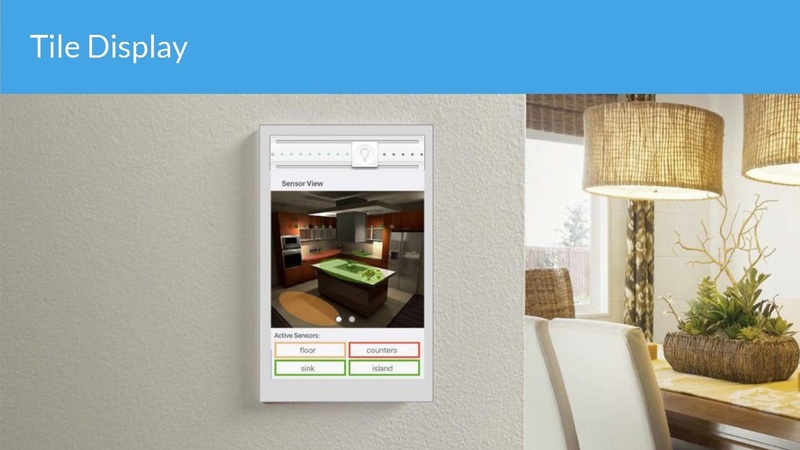 The tile allows a user to see the general information about the condition of the space that they are in as well as a specific breakdown about it.